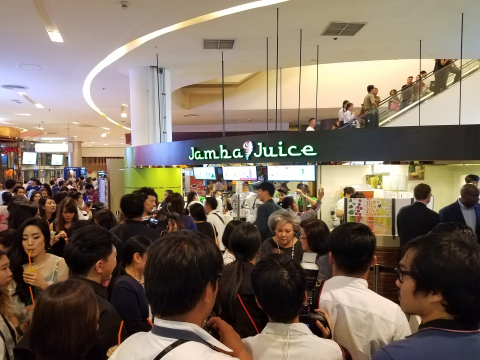 Jamba, Inc. (Nasdaq: JMBA), a leading lifestyle brand whose mission is to inspire and simplify healthy living, announced the opening of its first Thailand location on May 25th, operated by franchise partner, King of Juices Company, LTD ("King of Juices"). The store is located in the Siam Paragon Mall in Bangkok. King of Juices is committed to developing the brand to 30 stores in Thailand over the next 10 years. The Siam Paragon store is one of more than 900 Jamba locations globally, including international stores in South Korea, Philippines, UAE, Taiwan, Indonesia, with development agreements to open additional locations in Saudi Arabia, Bahrain, Oman, Kuwait, and Qatar. "The launch of the Thailand market builds upon our core strategy of expanding Jamba's global footprint, and further demonstrates the strength and appeal of the Jamba brand," noted Dave Pace, CEO of Jamba Juice. "We remain focused on growing brand presence in the Asia Pacific markets and GCC (Gulf Countries) markets where Jamba has proven successful," added Arnaud Joliff, SVP, Chief Systems Officer and GM International at Jamba. "We are grateful for our partnership with King of Juices, and look forward to growing Jamba in Thailand." "We are delighted to open our first store and bring Jamba Juice to Thailand," said Ausanee Mahagitsiri, King of Juices, CEO & President. "Siam Paragon Mall is one of the largest shopping centers in Asia, known for being a high end shopping destination with premium global brands. Jamba's fresh, hand-crafted blends align with the Thai consumer's desire for great taste, quality, convenience, and nutrition. We look forward to a long and prosperous partnership with Jamba in Thailand." The Jamba Juice Thailand menu is similar to Jamba's other Asia Pacific and U.S. markets, offering global favorites including fresh blended smoothies, juices, and bowls. The Thailand menu also appeals to local, Thai preferences, with core ingredients, such as mango, pineapple and watermelon. To celebrate the opening, Jamba hosted a grand opening event at the new store on May 25 th. Attended by some of Thailand's premier celebrities, media, and influencers, the celebration introduced guests to the Jamba lifestyle - a perfect blend of fit and fun. The evening's activities included performances, giveaways, a photo booth and a drum and dance procession. The company's CEO, Dave Pace, and SVP, Arnaud Joliff handed out smoothies to 40 schoolchildren in partnership with the Bangkok program for underprivileged kids, and guests sampled menu favorites throughout the evening. Jamba Juice is currently awarding franchise opportunities in other select markets around the globe. For more information, please visit www.jambafranchise.com.